Acute care hospitals aside, health care facilities in the state, such as nursing homes and clinics, fall well below the goal of vaccinating 90 percent of staff against flu by 2020. During the 2017-2018 season, influenza caused unusually high numbers of hospitalizations and deaths. At the same time, adult flu vaccination rates fell last season. Catholic Memorial Home in Fall River used teamwork and several strategies to improve its staff vaccination rate from 80 percent in 2016-2017 to 92 percent last year. Leadership commitment is important, and practical solutions, such as making it easy for personnel to get their flu shots on site, can help improve vaccination rates. New data from the Centers for Disease Control and Prevention (CDC) underscore the severity of last year’s flu season and the importance of vaccinating as many health care workers as possible. The CDC estimates flu caused 960,000 hospitalizations and 79,000 deaths across the United States during the 2017-2018 season. The overall burden of 48.8 million people sickened by the flu was higher than in any year since the H1N1 influenza pandemic in 2009. A number of factors combined for a bad flu season, including low rates of vaccination among adults. Although last year’s predominant flu virus – H3N2 – is known to be strong and not well controlled by vaccine, having only 37.1 percent of adults vaccinated heightened its impact. The vaccination rate for 2017-2018 dropped more than 14 percent from the previous year. Against the backdrop of last year’s high illness severity and low vaccination rates in the public, officials urge facilities in Massachusetts to do all they can to boost the number of health care workers who get flu shots. 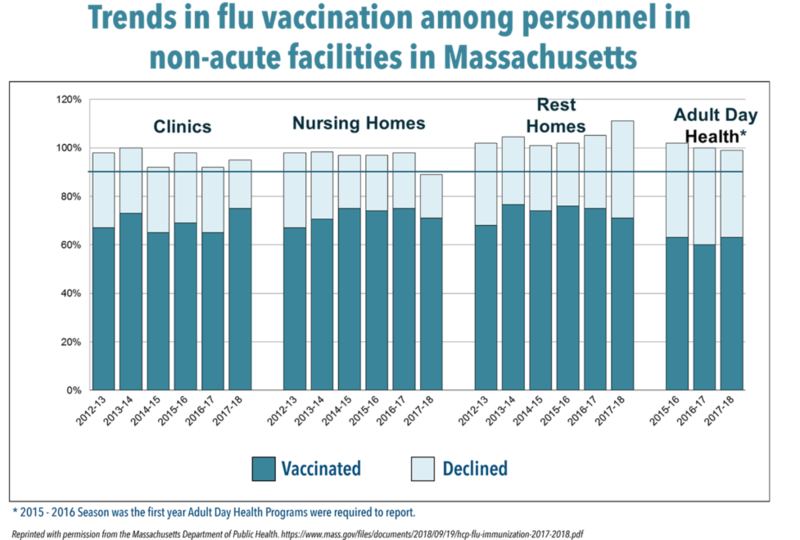 So far, the Massachusetts Department of Public Health (DPH) reports only acute care hospitals have met the state and federal goal of 90 percent or more of health workers vaccinated against influenza each year by 2020. Other health care settings, including clinics, rest homes and adult day health programs, report lower and, in some cases, declining rates of vaccination. Nursing homes, whose frail, elderly residents are particularly vulnerable to the ravages of influenza, posted a 71 percent overall vaccination rate for health care workers in 2017-2018, down from 75 percent the previous season, 73 percent in 2015-2016 and 76 percent in 2014-2015. Older adults, age 65 and above, accounted for 70 percent of last season’s hospitalizations and 90 percent of deaths, according to the CDC. 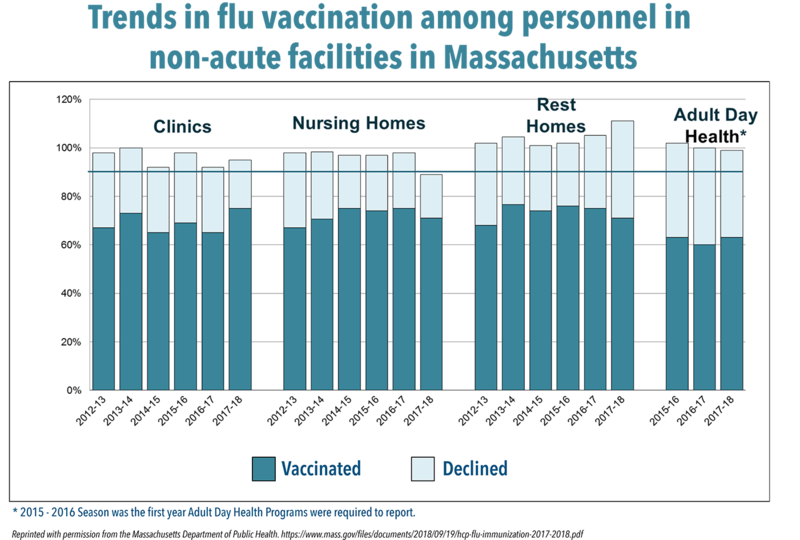 Here in Massachusetts, DPH counted 406 clusters of influenza-like illness, many in nursing homes, up from 261 in 2016-17, 67 in 2015-16 and 286 in 2014-15. It was our whole team at Catholic Memorial Home that was able to help out and achieve our success. We had lots of leadership support. Despite these challenges, some nursing homes have mounted successful campaigns to boost staff vaccination rates. In Fall River, for instance, Catholic Memorial Home vaccinated 92 percent of its health care personnel last season, up from 80 percent in 2016-2017. The skilled nursing home has an average of 370 staff members and 277 residents. Among other things, Catholic Memorial instituted a mandatory vaccine policy, and for the past two years has required unvaccinated staff to wear masks while caring for residents. “Being made to wear a mask, some of them opted to be vaccinated instead,” Murphy says. Once an employee is vaccinated, the home adds a sticker to his/her name badge; the badge must be worn visibly so the vaccination status is clear. Staff members who do not get vaccinated must sign a declination form. Staff education. Catholic Memorial promoted vaccination with flyers, newsletter notices, brochures and memos. Tracking and follow-up. Mid-season, the administration sent a reminder letter to staff. With the help of human resources, supervisors and department heads were regularly told which staff members had not yet been vaccinated and then followed up with them.